Due to some ENEL (Electric company) scheduled maintenance, power was disconnected for more than 3 hours, sucking out all the juice from our modified UPS (connected to a 12V car battery). Unfortunately, this cleared Medialab uptime (459 days!) and forced us to shut down our online computers (SNORRY and GLORRY VAX/VMS, and Corazzini with his emulator setup for PDP-11 and russian systems). In spite of a good SHUTDOWN procedure, when power came back we had some problems on our MicroVAX 3100/40 (SNORRY): a well known RAM problem we were struggling with since some time. So we opened the computer, doing a big maintenance, cleaning all boards, connectors, power supply and checking the RAM one by one. So we found the faulty 4MB module. We temporarily booted the system with only 24MB RAM instead of 32 (RAM modules must be paired); meanwhile, at our Museum we found two identical RAM modules, donated some years ago by Matteo Basso, that hereby we thank deeply! So now the system is back running again, online with 32MB RAM! We also checked and cleaned our VAXStation 4000/96 (GLORRY), that went back online with no problems at all. Just for fun, Corazzini gave us some boot problems, solved in some minutes. Mediualab (Slackware 7, Linux Kernel 2.2.19) went back online automatically without any problem. 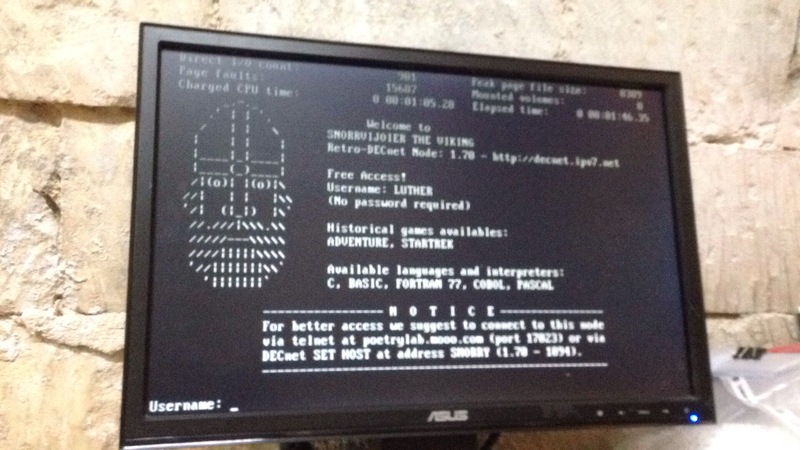 Our VAX/VMS are online 24/7, and are part of the RETRO-DECNET X25 amateur network: to connect and use them, just follow instruction on this webpage, and log in following the computer instruction on screen.